Eva Mae Siebert, daughter of Isaiah Siebert and Katie Athey,was born Aug. 4, 1877 at New Holland, Logan Co., Illinois and died April 29, 1970 at Lenox, Taylor Co., Iowa. 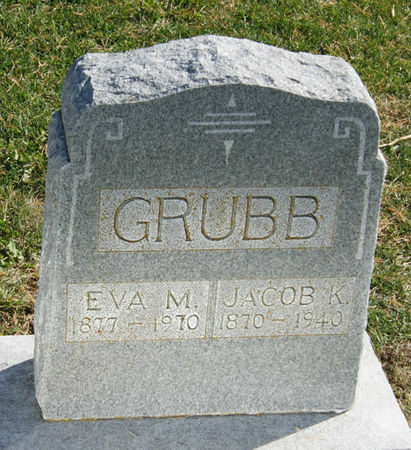 She married Jacob Karr Grubb Aug. 26, 1897 at Conway, Taylor Co., Iowa. He was born June 16, 1870 near Winfield, Louisa Co., Iowa, son of Colvin Grubb and Emily Lewis, and died Mar. 4, 1940 in Gravity, Taylor Co., Iowa. Searching for JACOB KARR GRUBB in Taylor County Iowa?